This well-known and widely used text is intended to prepare entry-level professional social workers with a foundation of the knowledge, values, and skills characteristic of the generalist perspective. 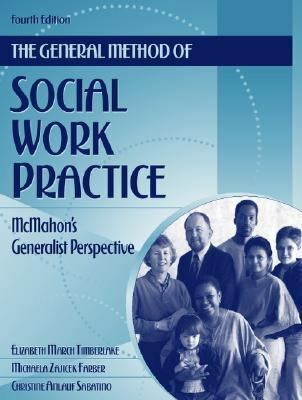 This edition updates text and references to retain Maria McMahon's general method of social work practice. In this revision, however, McMahon's generalist perspective has been reframed and expanded to include an ecological-systems perspective, a problem focus, a strength/needs orientation, a multi-level approach, an open selection of theories and interventions, and a problem-solving approach to practice. This edition emphasizes the influence of multiculturalism, social pluralism, and socio-demographic variability on individual and collective functioning, definition of problems and needs, and patterns of seeking and using help. These keystones are then used to enable social workers to understand and work with human diversity in their practice with individuals, families, groups, organizations, and communitiesTimberlake, Elizabeth M. is the author of 'General Method of Social Work Practice McMahon's Generalist Perspective', published 2001 under ISBN 9780205298167 and ISBN 0205298168.